The MAS6503 uses a ratiometric AD-converter principle employing a delta-sigma (DS) conversion technique, giving very good noise performance. Its current consumption is extremely low (18.3 μA, one pressure conversion in a second at maximum resolution and including sensor bridge current) and it can operate at low supply voltage from 1.8 V to 3.6 V which makes it an ideal solution for interfacing a piezo-resistive sensor in power consumption critical portable applications. The effective number of bits (ENOB) of the ADC is 17.4 bits. The over sampling ratio (OSR) of the DS-converter has five values to choose from for further optimization between conversion accuracy, speed and current consumption. MAS6503 also features supply voltage monitoring mode which is especially useful in battery operated systems. The external sensor bridge can be used to sense not only pressure but also temperature, using the built-in sensor sampling switches. 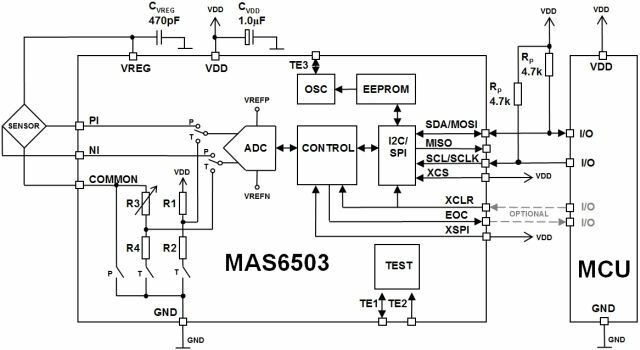 The MAS6503 communicates via a standard 2-wire I2C serial bus interface. Do you need IC samples? Do you need an evaluation board? Not for new designs, EOL Replaced by MAS6505.